Can the App Store's latest word game make it past the finishing line? Presentation is everything in mobile gaming, and having a unique hook is essential if you're to stand out in this crowded marketplace. Word Derby's approach to this problem is to deliver a very satisfying and solid word game, then dress it up as one of those fairground attractions where you furiously hurl balls into a hole in order to make your galloping horse inch closer and closer towards the finishing line. The better your word-score, the further you'll travel, so a multi-round race to the finish determines the winner of each game. At the start of each round you're presented with a tray full of Scrabble letters to form words from, but there's one of many twists here. Each player is limited to starting with a particular, locked letter, which you'll then have to base your word off. You have an unlimited amount of time to create this word, but if you can enter your best attempt before the timer runs out, you'll get a bonus points reward. This being a Scrabble-like game, you'll also want to make the best use you can of triple-word scores, double-letter scores and so on. The most interesting thing about Word Derby though is the betting system. When you download the game, you'll be given a chunk of in-game cash, with the option to place bets on your success at the start of each match. Win against a single player and you'll get double your money back, win against four players and you'll receive four times as much. Lose, of course, and your stake is gone forever. 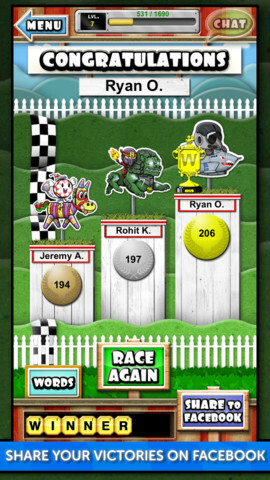 Getting a win is certainly fun enough but that money also comes in handy for buying the various power-ups in the game. 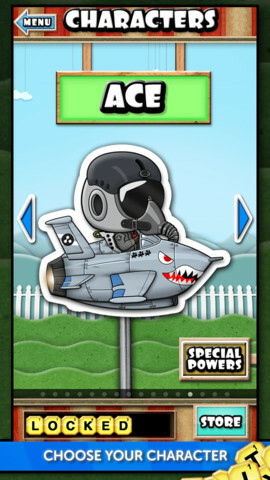 You might want to buy a bomb to remove the first-letter restriction, get a boost to catch up with a distant opponent, or buy a word hint (which feels a little bit too much like outright cheating for our money). You can even buy new characters if you fancy a cosmetic change on the racecourse. 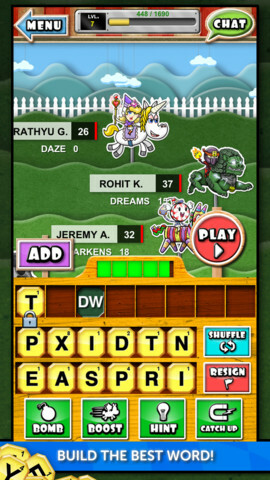 If you've played any of Zynga's social games before, you'll be very familiar with the matchmaking structure of Word Derby. You can choose to go head-to-head against random opponents (and have an unlimited number of games on the go at any one time), find matches with Facebook friends, or keep a contact list of worthy opponents for re-matches. As is the case with all multiplayer word games, you have to depend somewhat on the integrity and honesty of your opponents when playing online, and hope that they're not secretly tapping away at an anagram tool. We're also slightly torn on those power-ups that have such a drastic impact on the field of play. While it's always unfortunate for an opponent to trail far behind, balancing things out as sharply as this takes more from the victor than it gives to the loser. Don't let any of that put you off trying out what is a fine word game in the pantheon of App Store puzzlers though. There's a free, ad-supported version of the game which gives everyone a fair crack at the whip, along with a premium version if you find the ads too much of an eye-sore. With a single-device Pass and Play mode, this will also make for a fantastic family Christmas game. What's Hot: Great presentation and a nice take on traditional Scrabble gameplay. The betting system will keep even the keenest word puzzler on their toes. What's Not: The upgrade system unbalances much of the satisfying challenge and competition.